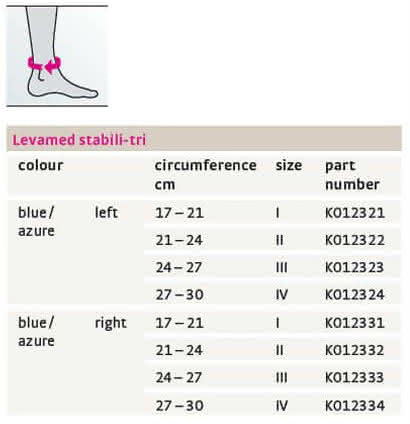 The Medi Levamed Stabil Tri Ankle Brace provides functional treatment and care of ankle injuries. 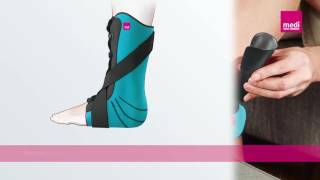 The modular orthosis offers support for ankle sprains, instability of the talocrural and subtalor joints, and post-op care for the ligaments of the entire ankle joint. Modular design supports functional treatment. Adaptable to the three healing phases – for safe and reliable treatment and mobilization of the patient. Talus lock tongue reduces anterior talar shift. 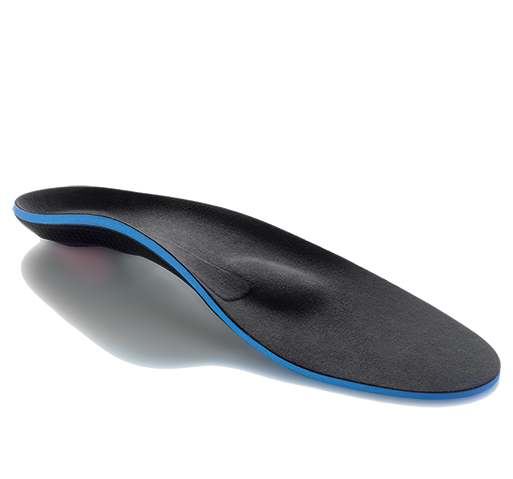 Medial stabilizing element provides support and relieves stresses on the lateral side of the foot. 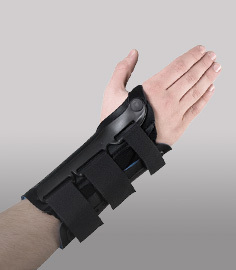 Stabilizing strap guides the foot in gentle pronation and supports the healing process. Compressive knit improves proprioception and promotes more rapid absorption of hematomas and edema. Available in four sizes - See sizing chart for measurement/fit help. Ankle sprains (grades 1 to 3). Chronic instability of the talocrural and subtalar joints. Postoperative care after surgery on the ligamentous apparatus of the ankle joint. My doctor recommended I use this after I had surgery on ankle ligaments from an accident. It helped my surgery heal and give me support with walking when I graduated from wearing a boot. 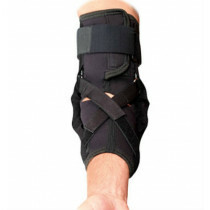 It provided me with a lot of support and took the stress off my tendons.  Medi Ankle believes that the best way for you to select and purchase an Medi product is at one of its authorized online stores of which DME-Direct is one. Only in these stores can you be sure to find the latest Medi collection and ensure you are getting a genuine Medi product with the manufacturer's full warranty. Medi therefore recommends that you do not purchase an Active item through any website, unless it is an authorized Medi dealer. We are a Medi Authorized Dealer and can assure you a safe and pleasant shopping experience here at our website as if you were at our wholesale distribution premises in Valencia, California. Some non-authorized sites sell counterfeit, second-hand merchandise, and/or products containing old fabrics, glues, and resins that do not perform as intended, and are therefore, not eligible for care under the Medi warranty. Others do not offer the original Medi warranty, nor do they offer any after-sales service of any kind. Medi takes great care to ensure that all Medi authorized dealers offer you the very best products and service. Please take advantage of the peace of mind that only they can offer to Medi purchasers.